All returns require a RMA number PRIOR to returning the product. Items without a RMA number will be refused. This policy is to protect our customers and to help us ensure that all returns are handled properly. Many manufacturers have clearly stated policies about how their warranty is handled and require that they handle it themselves. We will certainly do everything in our power to make sure that our customers are satisfied with their purchase - we want you to be happy with the items that you've purchased from Pool Supply Unlimited. To request a RMA number please visit our "Contact Us" page and send us a message stating the issue and how we can help. Pool Supply Unlimited does not have its own financing program. However, if you have a PayPal account you can apply for Paypal Credit, which allows for establishing a payment plan for merchandise available here. For more information on this program, formerly known as Bill Me Later, click here. How do I confirm my PayPal account address? • Add a credit or debit card to your account (this is fastest). • Be approved for the PayPal Extras MasterCard. • Request a confirmation code by mail after you’ve had your PayPal account for 90 days. 4. Click Add my card beside "Debit and credit cards." 5. Select the Card Type, then enter your card information. 2. Click Products and Services. 3. Click View all PayPal Products and then click PayPal Extras MasterCard. 4. Click Apply Now and complete your application and review the terms. 5. Click Agree and Continue to submit your application. 2. Click Help at the top of the page. 3. Enter Confirm my address in the Search box. 4. Click Is there another way to confirm my address? 5. Follow the instructions provided. International orders are shipped pending receipt of wire transfer. No international credit card payment will be accepted. Please email sales@poolsupplyunlimited.com for shipping quote and wire transfer information. International shipments going to Canada or Puerto Rico will be accepted using credit card or PayPal without additional information as long as billing and shipping addresses are the same and match what credit card company or PayPal have on file for card holder. Taxes and duties for shipments outside the U.S. are the responsibility of the customer. 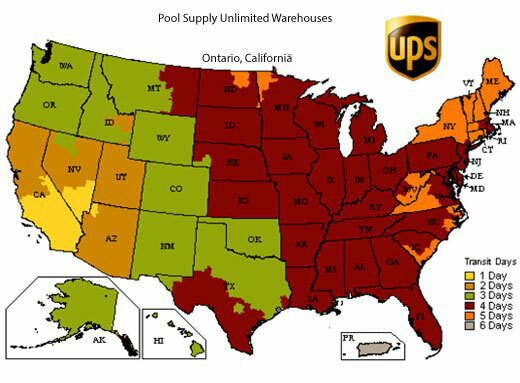 At Pool Supply Unlimited we prefer to ship as many orders as we can from our warehouse located in Ontario, California. This is not always possible, so we sometimes rely on drop-shipments from different suppliers to get your order shipped as soon as possible. We know that by shipping ourselves it's more likely that our customers will get the right product, shipped in the right condition the first time, and therefore this is our preference. Below you will find a UPS Ground time in transit map for orders shipping from our warehouses. Many of our orders ship on a freight truck, items like large pool filters, pool heaters, heat pumps, slides, diving boards, etc. Those shipments take about the same amount of time to reach the destination terminal (that carriers terminal closest to your location) but can take 1-3 additional days to go out for delivery. We can usually get products delivered to you faster using a expedited or guaranteed service when needed, please call (888) 836-6025 and we'd be happy to get you a quote.